We sell Findhorn Flower Essences products like Findhorn Sacred Earth Space - 100ml online in the UK and directly from our award-winning store in Scotland. 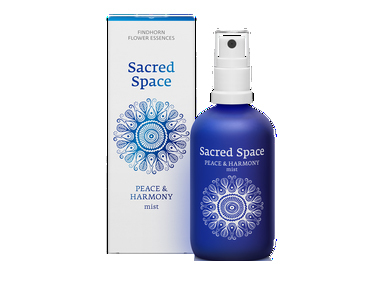 Sacred Space Room Spray: Helps to purify and clear your physical space to create a more relaxing atmosphere. Ingredients: Water (Aqua), Rose Oil (Rosa damascena) & Frankincense (Boswellia carterii). Spray this luxurious room mist in your home, office and aura. Use to rise above mundane states of mind and emotions. It is also an excellent aid to meditation. Findhorn room sprays are: handmade with love and attunement by a team of people dedicated to the principles of healing. Made from organically grown and wild Scottish flowers, plants and trees. Developed in the heart of Findhorn following the disciplines of co-creation with nature. We sell real Findhorn Flower Essences and other Flower Essences directly from our shop in Scotland and online throughout the UK. View more products from Findhorn Flower Essences. Where can you buy real Sacred Space Mist safely online? If you are wondering where you can buy Findhorn Sacred Earth Space - 100ml safely online in the UK, then shop with us. Sacred Space Mist - Findhorn Sacred Earth Space - 100ml in Flower Essences and Herbal Remedies, Tinctures & Supplements.